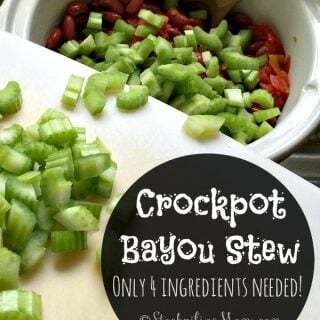 Crockpot Bayou Stew is a delicious slow cooker recipe that only has 4 ingredients! Spray crockpot with nonstick cooking spray. Add tomatoes, beans and celery to slow cooker and stir. Cover and cook on HIGH on for 4 hours. Stir in shrimp during the last 30 minutes of cooking and season with 1/4 tsp salt and 1/8 tsp pepper. **To cook on low -cook for 8 hours and then turn onto high, wait 5 minutes and put shrimp in for 30 minutes to cook.